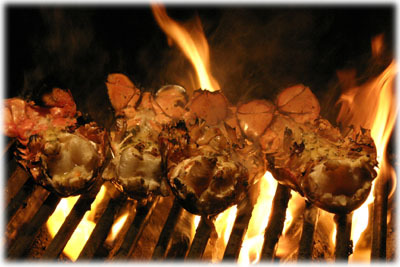 I think some people shy away from grilling lobster tails because they think it's too difficult. Or perhaps too expensive? 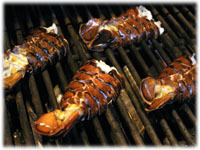 Actually, lobster tails are probably one of the easiest things you can grill, they just look difficult. And quite often fish markets and even regular grocery stores will have frozen lobster tails on sale - you just have to watch for them. Select fresh or frozen lobster tails. If frozen allow them to thaw overnight in the refrigerator. Just before grilling you'll split them open, butterfly them and squeeze a little fresh lemon juice and garlic over the meat. Once they're on the heat they'll be grilled for 3 minutes meat side down, then just flip them over and baste the meat with a rich white wine-tarragon garlic butter sauce as they continue grilling. This recipe takes only about 10 minutes to cook once you start grilling and the flavor and presentation is really spectacular. The classic pairing for grilled lobster tails is this traditional Filet Mignon Steak recipe but any grilled steak is the perfect companion to these famous tails. In a small sauce pan add the butter and melt over medium heat. When melted, add the white wine, juice of 1/2 a lemon, garlic, tarragon, dijon mustard, salt and whisk to combine. Heat to a gentle simmer over medium-low heat for several minutes. 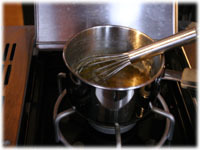 Keep the sauce warm until ready to use, whisking occasionally to keep the ingredients blended. 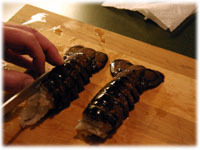 If using frozen lobster tails thaw them overnight in the refrigerator or place them in a resealable bag and submerge in lukewarm water until thawed. Do not refreeze thawed lobster tails. Place the thawed tails, hard shell side up, on a cutting board. Cut the hard shell lengthwise just to the tail with a pair of kitchen shears or scissors. Place a chef's knife in the cut you made and press down to split the tails. Butterfly or open the shells to expose the lobster meat. 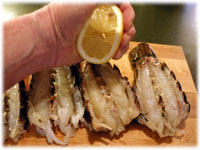 Squeeze 1/2 of the fresh lemon over the meat of each lobster tail. 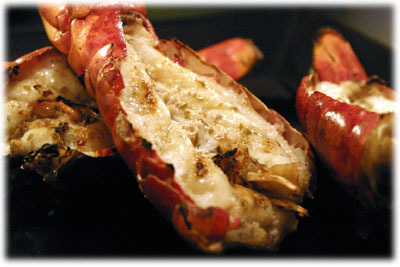 Sprinkle some of the garlic powder over the lobster tails, about 1/4 tablespoon each tail. 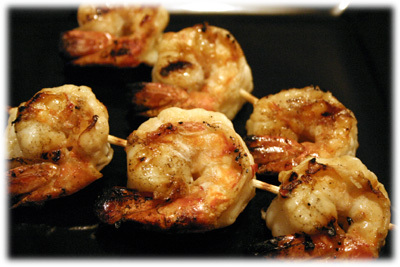 Cover with plastic wrap and place them in the refrigerator until ready to cook. Set up the grill for direct heat and bring it to 500F and oil the grates. 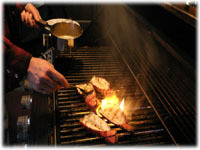 When the grill reaches this cooking temperature place the lobster tails meat side down on the grates and close the lid for 3 minutes. After 3 minutes of grilling lift the lid and flip each lobster tail over so the flesh side is up. The shells should be turning red or have turned red. Stir the basting sauce well. 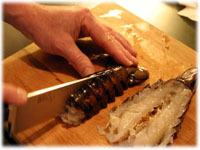 Baste the meat of each lobster tail with a couple tablespoons each of the tarragon-wine garlic butter sauce. Expect some flare-ups as the excess butter sauce drips onto the burner. Close the lid for 8 minutes. After the 8 minutes remove the grilled lobster tails to a serving platter. Baste with a little of the garlic butter sauce and cover. Serve the grilled tails with the left over garlic butter sauce on the side.